An attractive species, the Burmese star tortoise features an oblong and moderately domed carapace that is dark in color (black to deep brown). This pattern is yellow or cream colored and may cover a larger portion of the scute depending on the individual. “Wide banding” of the pattern, as it is sometimes referred to as in more aesthetically pleasing specimens, is highly sought after by collectors. The head of the Burmese star is yellow-ish or light colored with fewer dark areas than the head of the Indian star. Long, powerful legs with thick scales enable the tortoise to walk “tall and proud”. Large, dark eyes on either side of the head protrude and give this species a rather wise yet comical look. Depending on your location, this species can be housed either indoors or out. Several keepers swear by housing them inside in artificial, controlled conditions and while this method clearly has proven to be successful, natural sunlight is always beneficial. In Myanmar, they inhabit dry, deciduous forests but adapt well in captive situations. Outside, a strong-walled enclosure (4.2 x 4.2 meters (14 x 14 feet) for up to a trio of adults) in a sunny area on well-drained substrate works well. Grass lawns are always a bad idea, so removing the grass where the pen will be is advised. Inside, we have success housing several different species of tortoises including G. platynota in large, wooden “tortoise table” type units. Here, space of course can be an issue but a pair of adults should be provided with at least an 2.4 x 1.2 meters (8 x 4 feet) enclosure. Low growing bushes and shrubs offer cover and so do large logs. Rabbit hutches with the legs sawed off so they are at ground level, or chicken coops work well as shelters for these tortoises or you can construct your own out of pressure treated wood. Indoors, I have the most success using cypress mulch. It holds humidity well and offers good traction. The tortoises can burrow in it if they feel the need and I use clay dishes when offering food to avoid ingestion of it. The 50/50 mix of top soil and play sand mentioned earlier works indoors as well but is of course messier. Burmese star tortoises can tolerate temperature fluctuation but are of course most active and do best when it’s warm. Ambient room temperature should remain around 27-31 ºC (82-88 ºF) with a basking spot of 38 ºC (100 ºF) or more. It is not necessary to add an additional heat source at night and the room can be allowed to drop significantly. It is always wise to keep an eye on these temperature drops though, to be sure they don’t bottom out at a dangerous degree. Outside, the tortoises can be left to enjoy the sun and the elements during the spring, summer and part of the fall depending on your geographical location. When the nights start to consistently fall around 6-7 ºC (44-46 ºF), it’s time to move them back inside into their winter quarters. Mercury vapor bulbs of 150 watts provide an excellent basking situation for platynota and they emit both UVA and UVB rays. These bulbs do tend to lose the intensity of the UV faster then the companies who manufacture them say they do, so replace them every six months or so. Using them in combination with 10.0 UVB fluorescent tube doesn’t hurt. These bulbs work for both hatchlings, juveniles and adults but be careful with hatchlings. The powerful Mercury vapor bulbs can dry them out quickly. All ages of Burmese stars should have constant access to fresh water via shallow dishes or poultry waters (which I have found to be easier to clean and even keep clean because the tortoises can drink from them, but not usually defecate in them). Fresh water should always be available via large, shallow stainless steel dishes, sunken into the ground. 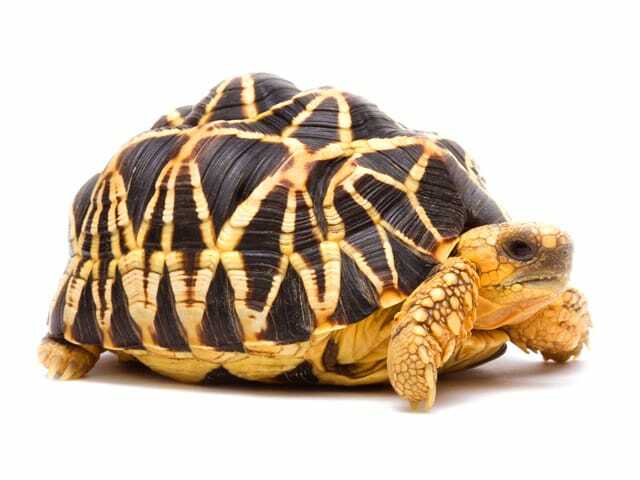 Keeping a relative humidity level of between 75 and 85% helps the tortoises stay well hydrated and aids in preventing excessive pyramiding of the shell. Burmese star tortoises are particularly fond of rain showers and react quickly to them by relieving themselves and tromping around during them. They will extend their necks into the falling rain and drink from puddles. Spraying them down with the garden hose on hot days does not go unnoticed. Indoors, spray bottles can be used or you can install a misting system. I have found the ExoTerra monsoon system to be very effective for platynota and all other tortoise species, especially neonates. Burmese star tortoises will accept a wide variety of foood items and ours are offered the following: Mazuri tortoise diets, fresh organic weeds (dandelion, clover, cat’s ear, wild strawberry, plantain, hawksbit and thistle) and the occasional produce (collards, mustards, turnip greens and squashes), fruits very sparingly (papaya, banana, tomato, strawberries) and herbs. I also practice a method of mixing Mazuri tortoise chow with various organic, dried herbs that I buy in bulk online. It’s an excellent way to feed our platynota and all other tortoise species especially during the winter when more natural items are not easily accessible. Of all the tortoises in captivity, the Burmese star quite possibly has one of the best personalities out there. They are highly adaptive and have proven to thrive in captive situations. This species quickly learns to associate its keeper as the food source and will enthusiastically approach in search of something to eat. We can even pet and scratch our Burmese stars’ heads and necks, they rarely flinch or withdraw into their carapaces. A very, very outgoing and responsive tortoise to work with. Daily cleansing of food and water dishes along with spot cleaning feces and uneaten food. When using the proper substrate and allowing it to remain bioactive, harmless organisms living within the substrate help to keep it natural and clean. Every few months the substrate can be swapped out but we do not do this outdoors. Upper respiratory infections are common in tortoises being transported around and egg binding is a real threat in gravid females that become uncomfortable in their surroundings. Providing enough space helps to prevent this.